HARRISBURG – Riverview Financial Corp. announces that John G. Soult Jr. was named chairman of the board of directors of Riverview Financial and Riverview Bank, effective November of 2018. 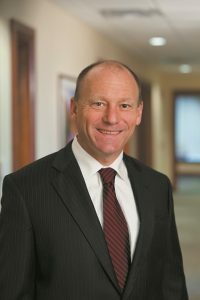 Soult, who joined the board of CBT Financial Corp. in 2007, has been a member of the Riverview Financial board since 2017. Soult assumed the position from immediate past Chairman, William E. Wood, a transition, which was identified as part of the 2017 Agreement and Plan of Merger between Riverview Financial Corp. and CBT Financial Corp. Wood will remain on the board through the remainder of his term. Soult is vice president of Soult Wholesale Company, a wholesale building materials company based in Clearfield. He earned a Bachelor of Arts degree in economics from Dickenson College and a Master of Science degree in business from Johns Hopkins University. “We have confidence in Mr. Soult’s ability to lead our board of directors,” stated Brett D. Fulk, president and chief executive officer of Riverview Financial Corp. and Riverview Bank. Riverview Financial Corp. is the parent company of Riverview Bank and its operating divisions Citizens Neighborhood Bank & CBT Bank. Riverview Bank operates 30 community banking offices throughout Berks, Blair, Centre, Clearfield, Dauphin, Huntingdon, Lebanon, Lycoming, Northumberland, Perry, Schuylkill and Somerset counties.